Levels & Lines is a multi-media, multi-dimensional abstract ballet, which began in 2000 as a series of long-legged dance-scapes. Originally inspired by abstract-expressionist artist, Joan Mitchell, whose work at first seems to be purely abstract in form but to me is also layered with texture and emotional tone. Levels & Lines came out of my curiosity about the body’s distorted movements and form that developed from having attachments to the legs. I wanted to see if it was possible to explore scale, shape and form so that ultimately you would just see the movement and almost forget we are dancing on three-foot high stilts. Levels & Lines also references and is inspired by neo-classical ballet and the pointe shoe. 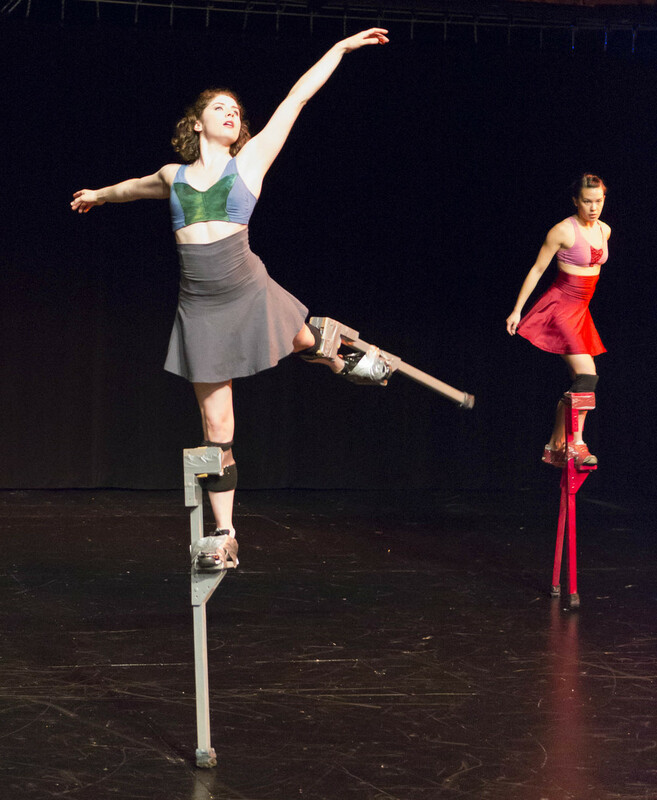 The stilts can actually represent a pointe shoe - elongating the line of the leg, the interplay of balance and weight. I utilize the stilts as a catalytic vehicle to extend performance space, alter perspective, experiment with scale and proportion, and play with symbolism and metaphors. Each new version of Levels & Lines like a painter’s canvas has evolved and been altered by the particular cast involved as well as the various collaborators such as the lighting designer, video creator and costumer. Levels & Lines: The Moving Target, a seamless sequence of solos, duets and larger ensemble pieces performed at varying tempos, is the latest incarnation in Isabelle’s Levels & Lines series featuring 7 performers dancing on the ground and using a variety of stilt heights even one-legged stilts, pointe shoes and aerial harness suspension. The work is highly technical, abstract dance with an emotional undertone. A video backdrop by award winning Octane Rich Media adds to the ambience and moving picture creating a large scale moving painting. Special thanks to the previous casts and collaborators of various versions of L&L for their input and artistry.